This document was reviewed and approved by the Professional Practice Committee of the American Diabetes Association and by an ad hoc committee of the European Association for the Study of Diabetes (U. Smith, Gothenburg, Sweden; S. Del Prato, Pisa, Italy; C. Bailey, Birmingham, UK; and B. Charbonnel, Nantes, France). Simultaneous publication: This article is being simultaneously published in 2006 in Diabetes Care and Diabetologia by the American Diabetes Association and the European Association for the Study of Diabetes. Copyright 2006 by the American Diabetes Association, Inc. and Springer. Copying with attribution allowed for any noncommercial use of the work. The epidemic of type 2 diabetes in the latter part of the 20th and in the early 21st century, and the recognition that achieving specific glycaemic goals can substantially reduce morbidity, have made the effective treatment of hyperglycaemia a top priority [1, 2, 3]. While the management of hyperglycaemia, the hallmark metabolic abnormality associated with type 2 diabetes, has historically had centre stage in the treatment of diabetes, therapies directed at other coincident features, such as dyslipidaemia, hypertension, hypercoagulability, obesity and insulin resistance, have also been a major focus of research and therapy. Maintaining glycaemic levels as close to the non-diabetic range as possible has been demonstrated to have a powerful beneficial impact on diabetes-specific complications, including retinopathy, nephropathy and neuropathy in the setting of type 1 diabetes [4, 5]; in type 2 diabetes, more intensive treatment strategies have likewise been demonstrated to reduce complications [6, 7, 8]. Intensive glycaemic management resulting in lower HbA1c levels has also been shown to have a beneficial effect on cardiovascular disease (CVD) complications in type 1 diabetes [9, 10]; however, the role of intensive diabetes therapy on CVD in type 2 diabetes remains under active investigation [11, 12]. Some therapies directed at lowering glucose levels have additional benefits with regard to CVD risk factors, while others lower glucose without additional benefits. The development of new classes of blood glucose-lowering medications to supplement the older therapies, such as lifestyle-directed interventions, insulin, sulfonylureas and metformin, has increased the treatment options for type 2 diabetes. Whether used alone or in combination with other blood glucose-lowering interventions, the availability of the newer agents has provided an increased number of choices for practitioners and patients and heightened uncertainty regarding the most appropriate means of treating this widespread disease. Although numerous reviews on the management of type 2 diabetes have been published in recent years [13, 14, 15, 16], practitioners are often left without a clear pathway of therapy to follow. We developed the following consensus approach to the management of hyperglycaemia in the non-pregnant adult to help guide health care providers in choosing the most appropriate interventions for their patients with type 2 diabetes. The guidelines and algorithm that follow are based on clinical trials that have examined different modalities of therapy of type 2 diabetes and on the authors’ clinical experience and judgment, keeping in mind the primary goal of achieving and maintaining glucose levels as close to the non-diabetic range as possible. The paucity of high-quality evidence in the form of clinical trials that directly compare different diabetes treatment regimens remains a major impediment to recommending one class of drugs, or a particular combination of therapies, over another. 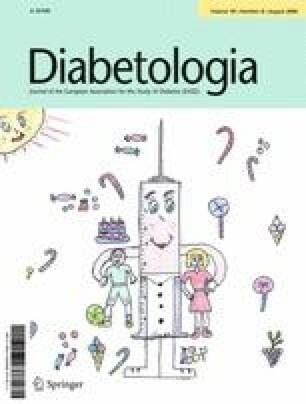 While the algorithm that we propose is likely to engender debate, we hope that the recommendations will help guide the therapy of type 2 diabetes and result in improved glycaemic control and health status over time. Controlled clinical trials, such as the DCCT  and the Stockholm Diabetes Intervention Study  in type 1 diabetes, and the UK Prospective Diabetes Study (UKPDS) [6, 7] and Kumamoto study  in type 2 diabetes, have helped to establish the glycaemic goals of therapy that result in improved long-term outcomes. Although the various clinical trials have had different designs, interventions and measured outcomes, the trials, in concert with epidemiological data [17, 18], support decreasing glycaemia as an effective means of reducing long-term microvascular and neuropathic complications. The most appropriate target levels for blood glucose, on a day-to-day basis, and HbA1c, as an index of chronic glycaemia, have not been systematically studied. However, both the DCCT  and the UKPDS [6, 7] had as their goals the achievement of glycaemic levels in the non-diabetic range. Neither study was able to sustain HbA1c levels in the non-diabetic range in their intensive-treatment groups, achieving mean levels over time of ∼7%, four standard deviations above the non-diabetic mean. The most recent glycaemic goal recommended by the American Diabetes Association, selected on the basis of practicality and the projected reduction in complications over time, is ‘in general’ an HbA1c level of <7% . For ‘the individual patient’, the HbA1c should be ‘as close to normal (<6%) as possible without significant hypoglycemia’. The most recent glycaemic goal set by the European Union-International Diabetes Federation is an HbA1c level<6.5%. The upper limit of the non-diabetic range is 6.1% (mean HbA1cof5%+2SD) with the DCCT-standardised assay, which has been promulgated through the National Glycohemoglobin Standardization Program (NGSP) and adopted by the vast majority of commercially available assays . Our consensus is that an HbA1c of ≥7% should serve as a call to action to initiate or change therapy, with the goal of achieving an HbA1c level as close to the non-diabetic range as possible or, at a minimum, decreasing the HbA1c to <7%. We are mindful that this goal is not appropriate or practical for some patients, and clinical judgment, based on the potential benefits and risks of a more intensified regimen, needs to be applied for every patient. Factors such as life expectancy and risk of hypoglycaemia need to be considered for every patient before intensifying therapeutic regimens. Assiduous attention to abnormalities other than hyperglycaemia that accompany type 2 diabetes, such as hypertension and dyslipidaemia, has been shown to improve microvascular and cardiovascular complications. Readers are referred to published guidelines for a discussion of the rationale and goals of therapy for the non-glycaemic risk factors, as well as recommendations on how to achieve them [1, 21, 22]. Choosing specific antihyperglycaemic agents is predicated on their effectiveness in lowering glucose, extraglycaemic effects that may reduce long-term complications, safety profiles, tolerability and expense. Apart from their differential effects on glycaemia, there are insufficient data at this time to support a recommendation of one class of glucose-lowering agents, or one combination of medications, over others with regard to effects on complications. In other words, the salutary effects of therapy on long-term complications appear to be predicated predominantly on the level of glycaemic control achieved rather than on any other specific attributes of the intervention(s) used to achieve glycaemic goals. The UKPDS compared three classes of glucose-lowering medications (sulfonylurea, metformin or insulin) but was unable to demonstrate clear superiority of any one drug over the others with regard to complications [6, 7]. However, the different classes do have variable effectiveness in decreasing glycaemic levels (Table 1), and the overarching principle in selecting a particular intervention will be its ability to achieve and maintain glycaemic goals. In addition to the intention-to-treat analyses demonstrating the superiority of intensive vs conventional interventions, the DCCT and UKPDS demonstrated a strong correlation between mean HbA1c levels over time and the development and progression of retinopathy and nephropathy [23, 24]. Therefore, we think it is reasonable to judge and compare blood glucose-lowering medications, and the combinations of such agents, primarily on the basis of the HbA1c levels that are achieved and on their specific side effects, tolerability and expense. In addition to variable effects on glycaemia, specific effects of individual therapies on CVD risk factors, such as hypertension or dyslipidaemia, were also considered important. Additionally, we included the effects of interventions that may benefit or worsen the prospects for long-term glycaemic control in our recommendations. Examples of these would be changes in body mass, insulin resistance or insulin secretory capacity in type 2 diabetic patients. Numerous reviews have focused on the characteristics of the specific diabetes interventions listed below [25, 26, 27, 28, 29, 30, 31, 32, 33]. The aim here is to provide enough information to justify the choices of medications, the order in which they are recommended, and the utility of combinations of therapies. Unfortunately, there is a dearth of high-quality studies that provide head-to-head comparisons of the ability of the medications to achieve the currently recommended glycaemic levels. The authors highly recommend that such studies be conducted. However, even in the absence of rigorous, comprehensive studies that directly compare the efficacy of all available glucose-lowering treatments and their combinations, we feel that there are enough data regarding the characteristics of the individual interventions to provide the guidelines below. An important intervention that is likely to improve the probability that a patient will have better long-term control of diabetes is to make the diagnosis early, when the metabolic abnormalities of diabetes are usually less severe. Lower levels of glycaemia at time of initial therapy are associated with lower HbA1c over time and decreased long-term complications . The major environmental factors that increase the risk of type 2 diabetes, presumably in the setting of genetic risk, are overnutrition and a sedentary lifestyle, with consequent overweight and obesity . Not surprisingly, interventions that reverse or improve these factors have been demonstrated to have a beneficial effect on control of glycaemia in established type 2 diabetes . While there is still active debate regarding the most beneficial types of diet and exercise, weight loss almost always improves glycaemic levels. Unfortunately, the high rate of weight regain has limited the role of lifestyle interventions as an effective means of controlling glycaemia in the long term. The most convincing long-term data that weight loss effectively lowers glycaemia have been generated in the follow-up of type 2 diabetic patients who have had bariatric surgery [37, 38]. In this setting, diabetes is virtually erased, with a mean sustained weight loss of >20 kg [37, 38]. Studies of the pharmacological treatment of obesity have been characterised by high drop-out rates, low sustainability, and side effects; weight loss medications cannot be recommended as a primary therapy for diabetes at this time. In addition to the beneficial effects of weight loss on glycaemia, weight loss and exercise improve coincident CVD risk factors, such as blood pressure and atherogenic lipid profiles, and ameliorate other consequences of obesity [37, 38, 39, 40]. There are few adverse consequences of such lifestyle interventions other than the difficulty in incorporating them into usual lifestyle and sustaining them, and the usually minor musculoskeletal injuries and potential problems associated with neuropathy, such as foot trauma and ulcers, that may occur with increased activity. Theoretically, effective weight loss, with its pleiotropic benefits, safety profile and low cost, should be the most cost-effective means of controlling diabetes, if it could be achieved and maintained long term. Given these beneficial effects, a lifestyle intervention programme to promote weight loss and increase activity levels should, with rare exceptions, be included as part of diabetes management. The beneficial effects of such programmes are usually seen rapidly, within weeks to months, and often before there has been substantial weight loss . Weight loss of as little as 4 kg will often ameliorate hyperglycaemia. However, the limited long-term success of lifestyle programmes to maintain glycaemic goals in patients with type 2 diabetes suggests that a large majority of patients will require the addition of medications over the course of their diabetes. The characteristics of currently available antidiabetic interventions, when used as monotherapy, are summarised in Table 1. The glucose-lowering effectiveness of individual therapies and combinations demonstrated in clinical trials is predicated not only on the intrinsic characteristics of the intervention, but also on the baseline glycaemia, duration of diabetes, previous therapy and other factors. A major factor in selecting a class of drugs, or a specific medication within a class, to initiate therapy or when changing therapy, is the ambient level of glycaemic control. When levels of glycaemia are high (e.g. HbA1c >8.5%), classes with greater and more rapid glucose-lowering effectiveness, or potentially earlier initiation of combination therapy, are recommended; conversely, when glycaemic levels are closer to the target levels (e.g. HbA1c<7.5%), medications with lesser potential to lower glycaemia and/or a slower onset of action may be considered. Obviously, the choice of glycaemic goals and the medications used to achieve them must be individualised for each patient, balancing the potential for lowering HbA1c and anticipated long-term benefit with specific safety issues, as well as other characteristics of regimens, including side effects, tolerability, patient burden and long-term adherence, expense and the non-glycaemic effects of the medications. Finally, type 2 diabetes is a progressive disease, with worsening glycaemia over time. Therefore, addition of medications is the rule, not the exception, if treatment goals are to continue to be met. Metformin is the only biguanide available in most of the world. Its major effect is to decrease hepatic glucose output and lower fasting glycaemia. Typically, metformin monotherapy will lower HbA1c by ∼1.5 percentage points [27, 42]. It is generally well tolerated, with the most common adverse effects being gastrointestinal. Although always a matter of concern because of its potentially fatal outcome, lactic acidosis is quite rare (<one case per 100,000 treated patients) . Metformin monotherapy is usually not accompanied by hypoglycaemia and has been used safely, without causing hypoglycaemia, in patients with pre-diabetic hyperglycaemia . The major non-glycaemic effect of metformin is either weight stability or modest weight loss, in contrast to many of the other blood glucose-lowering medications. The UKPDS demonstrated a beneficial effect of metformin therapy on CVD outcomes , which needs to be confirmed. Sulfonylureas lower glycaemia by enhancing insulin secretion. They appear to have an effect similar to metformin, and they lower HbA1c by ∼1.5 percentage points . The major adverse side effect is hypoglycaemia, but severe episodes, characterised by need for assistance, coma or seizure, are infrequent. However, such episodes are more frequent in the elderly. Episodes can be both prolonged and life threatening, although these are very rare. Several of the newer sulfonylureas have a relatively lower risk for hypoglycaemia (Table 1) [45, 46]. In addition, weight gain of ∼2 kg is common with the initiation of sulfonylurea therapy. This may have an adverse impact on CVD risk, although this has not been established. Finally, sulfonylurea therapy was implicated as a potential cause of increased CVD mortality in the University Group Diabetes Program . Concerns raised by the University Group Diabetes Program study that sulfonylurea therapy may increase CVD mortality in type 2 diabetes were not substantiated by the UKPDS . Like the sulfonylureas, the glinides stimulate insulin secretion, although they bind to a different site within the sulfonylurea receptor . They have a shorter circulating half-life than the sulfonylureas and must be administered more frequently. Of the two glinides currently available in the US, repaglinide is almost as effective as metformin or the sulfonylureas, decreasing HbA1c by ∼1.5 percentage points. Nateglinide is somewhat less effective in lowering HbA1c than repaglinide when used as monotherapy or in combination therapy [48, 49]. The glinides have a similar risk for weight gain as the sulfonylureas, but hypoglycaemia may be less frequent, at least with nateglinide, than with some sulfonylureas [49, 50]. α-Glucosidase inhibitors reduce the rate of digestion of polysaccharides in the proximal small intestine, primarily lowering postprandial glucose levels without causing hypoglycaemia. They are less effective in lowering glycaemia than metformin or the sulfonylureas, reducing HbA1c by 0.5–0.8 percentage points . Since carbohydrate is absorbed more distally, malabsorption and weight loss do not occur; however, increased delivery of carbohydrate to the colon commonly results in increased gas production and gastrointestinal symptoms. This side effect has led to discontinuation of the α-glucosidase inhibitors by 25–45% of participants in clinical trials [29, 51]. One clinical trial examining acarbose as a means of preventing the development of diabetes in high-risk subjects with impaired glucose tolerance showed an unexpected reduction in severe CVD outcomes . This potential benefit of α-glucosidase inhibitors needs to be confirmed. Thiazolidinediones (TZDs or glitazones) are peroxisome proliferator-activated receptor γ modulators; they increase the sensitivity of muscle, fat and liver to endogenous and exogenous insulin (‘insulin sensitisers’) . The limited data regarding the blood glucose-lowering effectiveness of TZDs when used as monotherapy have demonstrated a 0.5–1.4% decrease in HbA1c. The most common adverse effects with TZDs are weight gain and fluid retention. There is an increase in adiposity, largely subcutaneous, with redistribution of fat from visceral deposits shown in some studies. The fluid retention usually manifests as peripheral oedema, though new or worsened heart failure can occur. The TZDs either have a beneficial or neutral effect on atherogenic lipid profiles, with pioglitazone having a more beneficial effect than rosiglitazone [52, 53]. The Prospective Pioglitazone Clinical Trial in Macrovascular Events (PROactive) study demonstrated no significant effects of pioglitazone compared with placebo on the primary CVD outcome (composite of all-cause mortality, non-fatal and silent myocardial infarction, stroke, major leg amputation, acute coronary syndrome, coronary artery bypass graft or percutaneous coronary intervention, and leg revascularisation) after 3 years of follow-up, but a 16% reduction in death, myocardial infarction, and stroke, a secondary endpoint, was reported with marginal statistical significance . Insulin is the oldest of the currently available medications and has the most clinical experience. Although initially developed to treat the insulin-deficient type 1 diabetic patient, in whom it is life saving, insulin was used early on to treat the insulin-resistant form of diabetes recognised by Himsworth and Kerr . Insulin is the most effective of diabetes medications in lowering glycaemia. It can, when used in adequate doses, decrease any level of elevated HbA1c to, or close to, the therapeutic goal. Unlike the other blood glucose-lowering medications, there is no maximum dose of insulin beyond which a therapeutic effect will not occur. Relatively large doses of insulin (≥1 U/kg), compared with those required to treat type 1 diabetes, may be necessary to overcome the insulin resistance of type 2 diabetes and lower HbA1c to the target value. Although initial therapy is aimed at increasing basal insulin supply, usually with intermediate- or long-acting insulins, patients may also require prandial therapy with short- or rapid-acting insulins (Fig. 1). Insulin therapy has beneficial effects on triglyceride and HDL cholesterol levels , but is associated with weight gain of ∼2–4 kg, probably proportional to the correction of glycaemia, and owing predominantly to the reduction of glycosuria. As with sulfonylurea therapy, the weight gain may have an adverse effect on cardiovascular risk. Insulin therapy is also associated with hypoglycaemia, albeit much less frequently than in type 1 diabetes. In clinical trials aimed at normoglycaemia and achieving a mean HbA1c of ∼7%, severe hypoglycaemic episodes (defined as requiring help from another person to treat) occurred at a rate of between 1 and 3 per 100 patient-years [8, 56, 57, 58, 59] compared with 61 per 100 patient-years in the DCCT intensive-therapy group . Insulin analogues with longer, non-peaking profiles may decrease the risk of hypoglycaemia compared with NPH, and analogues with very short durations of action may reduce the risk of hypoglycaemia compared with regular insulin [60, 61]. Inhaled insulin was approved in the US in 2006 for the treatment of type 2 diabetes. Published clinical studies to date have not demonstrated whether inhaled insulin, given as monotherapy [62, 63] or in combination with an injection of long-acting insulin , can lower HbA1c to ≤7%. Glucagon-like peptide 1 (GLP-1) 7–37, a naturally occurring peptide produced by the L cells of the small intestine, stimulates insulin secretion. Exendin-4 has homology with the human GLP-1 sequence but has a longer circulating half-life. It binds avidly to the GLP-1 receptor on the pancreatic beta cell and potentiates glucose-mediated insulin secretion . Synthetic exendin-4 (exenatide) was approved for use in the US in 2005 and is administered twice per day by subcutaneous injection. Although there are far less published data on this new compound than the other blood glucose-lowering medications, exendin-4 appears to lower HbA1c by 0.5–1 percentage points, mainly by lowering postprandial blood glucose levels [65, 66, 67, 68]. Exenatide also suppresses glucagon secretion and slows gastric motility. It is not associated with hypoglycaemia, but has a relatively high frequency of gastrointestinal side effects, with 30–45% of treated patients experiencing one or more episodes of nausea, vomiting or diarrhoea [65, 66, 67, 68]. In published trials, exenatide is associated with a weight loss of ∼2–3 kg over 6 months, some of which may be a result of its gastrointestinal side effects. Currently, exenatide is approved for use in the US with sulfonylurea and/or metformin. Pramlintide is a synthetic analogue of the beta cell hormone amylin. Currently, pramlintide is approved for use in the US only as adjunctive therapy with insulin. Pramlintide is administered subcutaneously before meals and slows gastric emptying, inhibits glucagon production in a glucose-dependent fashion, and predominantly decreases postprandial glucose excursions . In clinical studies, HbA1c has been decreased by 0.5–0.7 percentage points . The major clinical side effects of this drug, which is injected before meals, are gastrointestinal in nature. Approximately 30% of treated participants in the clinical trials have developed nausea. Weight loss associated with this medication is ∼1–1.5 kg over 6 months; as with exenatide, some of the weight loss may be the result of gastrointestinal side effects. Except in rare circumstances, such as patients who are extremely catabolic or hyperosmolar, unable to hydrate themselves adequately, or with diabetic ketoacidosis (see Special considerations/patients below), hospitalisation is not required to initiate or adjust therapy. The patient is the key player in the diabetes care team and should be trained and empowered to prevent and treat hypoglycaemia, as well as to adjust medications with the guidance of health care providers to achieve glycaemic goals. Many patients may be managed effectively with monotherapy; however, the progressive nature of the disease will require the use of combination therapy in many, if not most, patients over time to achieve and maintain glycaemia in the target range. The measures of glycaemia that are initially targeted on a day-to-day basis are the fasting and preprandial glucose levels. Self-monitoring of blood glucose (SMBG) is an important element in adjusting or adding new interventions and, in particular, in titrating insulin doses. The need for and number of required SMBG measurements are not clear  but are dependent on the medications used. Oral hypoglycaemic regimens that do not include sulfonylureas, and are therefore not likely to cause hypoglycaemia, usually do not require SMBG. However, SMBG may be used to determine whether therapeutic blood glucose targets are being achieved and to adjust treatment regimens without requiring the patient to have laboratory-based blood glucose testing. A fasting glucose level measured several times per week generally correlates well with the HbA1c level. Insulin therapy requires more frequent monitoring. The levels of plasma or capillary glucose (most meters that measure fingerstick capillary samples are adjusted to provide values equivalent to plasma glucose) that should result in long-term glycaemia in the non-diabetic target range, as measured by HbA1c, are fasting and preprandial levels between 3.89 and 7.22 mmol/l (70 and 130 mg/dl). If these levels are not consistently achieved, or HbA1c remains above the desired target, postprandial levels, usually measured 90–120 min after a meal, may be checked. They should be less than 10 mmol/l (180 mg/dl) to achieve HbA1c levels in the target range. Attempts to achieve target glycaemic levels with regimens including sulfonylureas or insulin may be associated with modest hypoglycaemia, with glucose levels in the 3.06–3.89-mmol (55–70-mg/dl) range. These episodes are generally well tolerated, easily treated with oral carbohydrate, such as glucose tablets or 120–180 ml juice or non-diet soda, and rarely progress to more severe hypoglycaemia including loss of consciousness or seizures. The algorithm (Fig. 2) takes into account the characteristics of the individual interventions, their synergies, and expense. The goal is to achieve and maintain glycaemic levels as close to the non-diabetic range as possible and to change interventions at as rapid a pace as titration of medications allows. Pramlintide, exenatide, α-glucosidase inhibitors and the glinides are not included in this algorithm, owing to their generally lower overall glucose-lowering effectiveness, limited clinical data and/or relative expense (Table 1). However, they may be appropriate choices in selected patients. lifestyle intervention and metformin. Based on the numerous demonstrated short- and long-term benefits that accrue when weight loss and increased levels of activity are achieved and maintained, and the cost-effectiveness of lifestyle interventions when they succeed, the consensus is that lifestyle interventions should be initiated as the first step in treating new-onset type 2 diabetes (Fig. 2). These interventions should be implemented by health care professionals with appropriate training, usually registered dietitians with training in behavioural modification, and be sensitive to ethnic and cultural differences among populations. Moreover, lifestyle interventions to improve glucose, blood pressure and lipids levels, and to promote weight loss or at least avoid weight gain, should remain an underlying theme throughout the management of type 2 diabetes, even after medications are used. For the 10–20% of patients with type 2 diabetes who are not obese or overweight, modification of dietary composition and activity levels may play a supporting role, but medications are generally required earlier (see Special considerations/patients below). The authors recognise that for most individuals with type 2 diabetes, lifestyle interventions fail to achieve or maintain metabolic goals, either because of failure to lose weight, weight regain, progressive disease or a combination of factors. Therefore, our consensus is that metformin therapy should be initiated concurrent with lifestyle intervention at diagnosis. Metformin is recommended as the initial pharmacological therapy, in the absence of specific contraindications, for its effect on glycaemia, absence of weight gain and hypoglycaemia, generally low level of side effects, high level of acceptance and relatively low cost. Metformin treatment should be titrated to its maximally effective dose over 1–2 months, as tolerated (Table 2). Rapid addition of other glucose-lowering medications should be considered in the setting of persistent symptomatic hyperglycaemia. additional medications. If lifestyle intervention and maximal tolerated dose of metformin fail to achieve or sustain glycaemic goals, another medication should be added within 2–3 months of the initiation of therapy or at any time when the HbA1c goal is not achieved. There was no strong consensus regarding the second medication added after metformin other than to choose among insulin, a sulfonylurea or a TZD (Fig. 2). As discussed above, the HbA1c level will determine in part which agent is selected next, with consideration given to the more effective glycaemia-lowering agent, insulin, for patients with a HbA1c of >8.5% or with symptoms secondary to hyperglycaemia. Insulin can be initiated with a basal (intermediate- or long-acting) insulin (see Fig. 1 for suggested initial insulin regimens) . The relative increased cost of the newer agents that are only available as brand medications must be balanced against their relative benefits. further adjustments. If lifestyle, metformin and a second medication do not result in goal glycaemia, the next step should be to start, or intensify, insulin therapy (Fig. 1). When HbA1c is close to goal (<8.0%), addition of a third oral agent could be considered; however, this approach is relatively more costly and potentially not as effective in lowering glycaemia compared with adding or intensifying insulin . Intensification of insulin therapy usually consists of additional injections that might include a short- or rapid-acting insulin given before selected meals to reduce postprandial glucose excursions (Fig. 1). When prandial rapid- or very rapid acting insulin injections are started, insulin secretagogues (sulfonylurea or glinides) should be discontinued, or tapered and then discontinued, since they are not considered synergistic with administered insulin. 1. Begin with low-dose metformin (500 mg) taken once or twice per day with meals (breakfast and/or dinner). 2. After 5–7 days, if GI side effects have not occurred, advance dose to 850 or 1,000 mg before breakfast and dinner. 3. If GI side effects appear as doses advanced, can decrease to previous lower dose and try to advance dose at a later time. 4. The maximum effective dose is usually 850 mg twice per day, with modestly greater effectiveness with doses up to 3 g per day. GI side effects may limit the dose that can be used. 5. Based on cost considerations, generic metformin is the first choice of therapy. A longer-acting formulation is available in some countries and can be given once per day. More than one medication will be necessary for the majority of patients over time. Selection of the individual agents should be made on the basis of their glucose-lowering effectiveness and other characteristics listed in Table 1. However, when adding second and, potentially, third antihyperglycaemic medications, the synergy of particular combinations and other interactions should be considered. In general, antihyperglycaemic drugs with different mechanisms of action will have the greatest synergy. Insulin plus metformin  and insulin plus a TZD  are particularly effective means of lowering glycaemia. The increased risk of fluid retention with the latter combination must be considered. (TZD in combination with insulin is not currently approved in the European Union.) Although both TZDs and metformin effectively increase sensitivity to insulin, they have different target organs and have been shown to have modest additive effects, with addition of TZD to metformin lowering HbA1c by 0.3–0.8% [75, 76]. In the setting of severely uncontrolled diabetes with catabolism, defined as fasting plasma glucose levels >13.9 mmol/l (250 mg/dl), random glucose levels consistently >16.7 mmol/l (300 mg/dl), HbA1c >10%, or the presence of ketonuria, or as symptomatic diabetes with polyuria, polydipsia and weight loss, insulin therapy in combination with lifestyle intervention is the treatment of choice. Some patients with these characteristics will have unrecognised type 1 diabetes; others will have type 2 diabetes but with severe insulin deficiency. Insulin can be titrated rapidly and is associated with the greatest likelihood of returning glucose levels rapidly to target levels. After symptoms are relieved, oral agents can often be added and it may be possible to withdraw insulin, if preferred. Type 2 diabetes is epidemic. Its long-term consequences translate into enormous human suffering and economic costs. We now understand that much of the morbidity associated with long-term complications can be substantially reduced with interventions that achieve glucose levels close to the non-diabetic range. Although new classes of medications, and numerous combinations, have been demonstrated to lower glycaemia, current-day management has failed to achieve and maintain the glycaemic levels most likely to provide optimal health care status for people with diabetes. D. M. Nathan has received research grants for investigator-initiated research from Aventis and Novo Nordisk. J. B. Buse has conducted research and/or served on advisory boards under contract between the University of North Carolina and Amylin, Becton Dickinson, Bristol-Myers Squibb, Hoffman-LaRoche, Lilly, Novo Nordisk, Merck, Novartis, Pfizer and Sanofi-Aventis. M. B. Davidson has received research support from Eli Lilly, Merck, and Pfizer; has served on advisory boards for Amylin, GlaxoSmithKline, Merck and Sanofi-Aventis, and has been on speakers bureaus for Amylin, Eli Lilly, GlaxoSmithKline and Pfizer. R. J. Heine has received research support from GlaxoSmithKline, Minimed-Medtronic, Novartis and Novo Nordisk, and has served on advisory boards for Amylin, Bristol-Myers Squibb, Merck, Novartis, Novo Nordisk, Pfizer and Sanofi-Aventis. R. R. Holman has received research support from Bristol-Myers Squibb, GlaxoSmithKline, Merck Santé, Novo Nordisk, Pfizer and Pronova, and has served on advisory boards and/or received honoraria for speaking engagements from Amylin, GlaxoSmithKline, Lilly, Merck Sharp & Dome, Novartis and Sanofi-Aventis. R. Sherwin has served on advisory boards for Amylin, Bristol-Myers Squibb, Eli Lilly, Merck and Takeda. B. Zinman has received research support from Eli Lilly, GlaxoSmithKline, Novartis and Novo Nordisk, and has been a member of scientific advisory boards and/or received honoraria for speaking engagements from Amylin, Eli Lilly, GlaxoSmithKline, Johnson & Johnson, Merck, Novartis, Pfizer, Sanofi-Aventis and Smiths Medical.